Following on from Common Training Splits which highlighted ways to divide your training over a given week, I want to discuss pre-made programs. There are literally thousands of programs out there, varying greatly in quality, but the most popular ones tend to rise to the top as they get results. 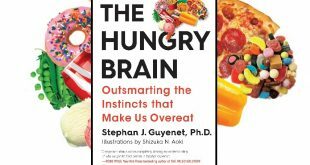 The ones you might see the most are from fitness magazines, where the author creates an untested program off the top of their head to illustrate the theme of the article (“Get Six Pack Abs”, “Tree Trunk Thighs In Six Weeks”). If you want to see what real lifters use, find a bodybuilding forum. 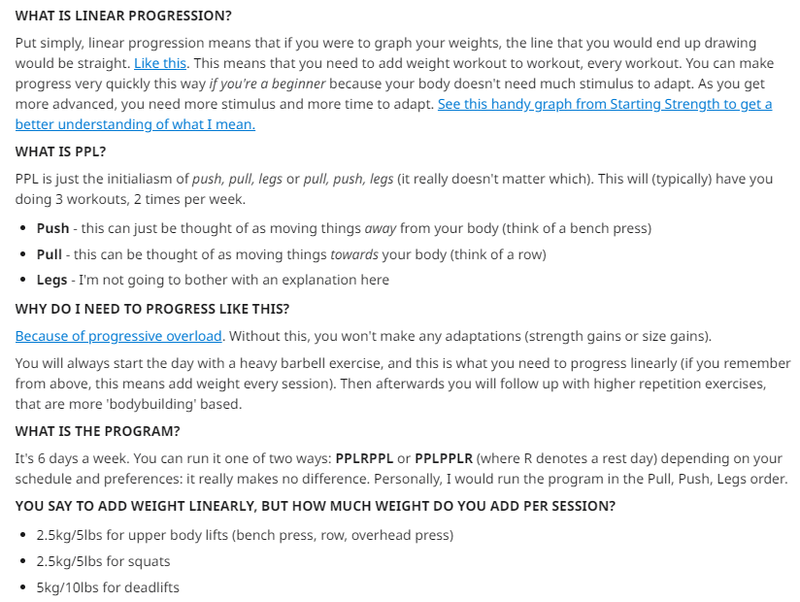 Above is a sample from the T-Nation Forums, note three examples where the program they are following is in the title of their training log (Westside For Skinny Bastards 3, The Juggernaut Method, and the original Westside For Skinny Bastards) and an example where they detail it in the first post (Wendler’s 5/3/1). Visit my resources page to see those programs and others. Some programs are intended to be ‘run’ for a given number of weeks, while others can be continued for as long as you see results. An example of the former is Smolov Jr., which is a three week program designed to help you break through a plateau (extended period of time without getting stronger). Once you complete it you would return to your regular training. In this article I want to focus on the long-term programs that you could potentially follow for 6 months or more. I have explained the finer aspects of the program in separate articles and here I briefly discuss the pro’s and cons of each. The foundation of this program is four exercises, the Back Squat, Deadlift, Bench Press and Overhead Press. Each one is paired with an ‘assistance’ exercise, such as Pull Ups or Romanian Deadlift. It’s based on a four week cycle, meaning every four weeks the sets and reps repeat themselves, but importantly the weight gets heavier. 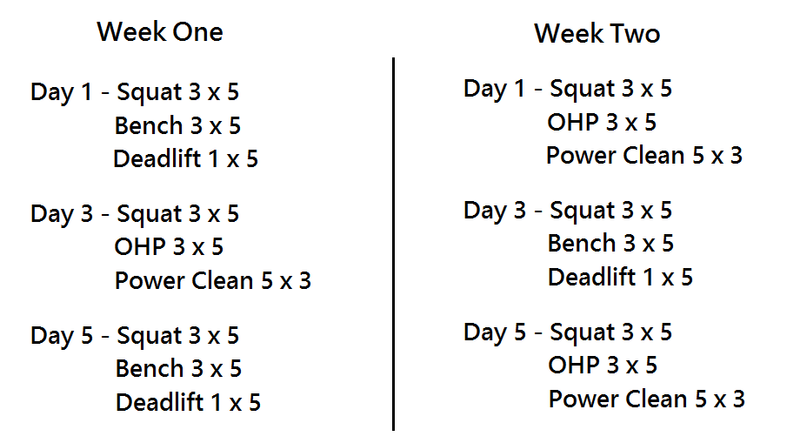 Here is an example of what the four weeks might look like for an exercise. Progressive Overload: Each week the maximum weight lifted increases. If you want to get stronger you must steadily increase the weight you are lifting. Work Sets: Most programs don’t explicitly mention any warm up sets you might do, they only show you the “work” sets. If you’re expected to lift 3 sets of 5 reps with 80kg, you might warm up with 60kg. With 5/3/1 the first two sets are effectively warm ups, for example in the first week if you can lift 62.5kg for 5 reps then doing 47.5kg and 55kg will be easy. AMRAP: This stands for As Many Reps As Possible, which means you keep going while you can still complete the lift with good technique. That’s what the “+” sign symbolises in the third set each week – where it says “5+” this means “do as many reps as you can, but do at least five reps”. Deload week: Some coaches believe that life gives you natural breaks where you can’t make it to the gym, so it isn’t always necessary to schedule an ‘easy’ week. In 5/3/1 every 4th week is effectively a recovery week, where you unload some of the weight you normally use to give your body a break. This is known as ‘active recovery’, and because your body is still moving it is more beneficial than skipping the gym completely in week 4. Assistance Lifts: While not mentioned here, depending on the version of 5/3/1, you will complete 1-2 more exercises on the same day as these Squats. It’s usually a complementary lift like a Deadlift or Front Squat, often for a higher number of total reps. These are to increase the overall volume of training you are doing, and it’s important that the priority should be given to excelling in the primary or key lift, in this case the Squat. Strength coaches will tell to avoid “Majoring in the minors”, meaning not to expend all your energy trying to get personal bests in your assistance lifts at the expense of your main lift of the day. Once you’ve established your one rep max, the program writes itself. You don’t need to worry about how much to lift as it’s decided for you based on percentages, you would just refer to a calculator like this. It allows for one all-out set. Having the opportunity to really push yourself in the “+” sets means you avoid complacency. I’ve seen friends do 18-20 reps on their 5+ days before. It has a progressive overload. One of the most important things about getting stronger is to continuously challenge your body with heavier weights. It focuses on the main lifts. Newbies to the gym shouldn’t concern themselves with Reverse Grip Spider Curls, getting in and doing the main movements each week will do wonders for their body. The maths can be intimidating. If you don’t know what a One Rep Max is or how to test it, you could be put off from giving this program a go. Doing AMRAP is no good if you can’t tell when your technique fails. This is fine for beginners if they are supervised or have a mirror to see their form, but sometimes ego gets in the way and they sneak a few low quality and potentially injury causing reps at the end. The Deload. One of the main criticisms of this program is the frequency of the deload. For the volume of training (one hard set on each exercise) some argue you don’t need to give your body a break so often. There are strategies to overcome this, like doing weeks 1-3 twice before including a week 4, as well as updated versions of 5/3/1 with additional sets. Speed of progression: For new lifters I found that they get stronger at a faster rate than the program ‘allows’. They end up being able to do 20+ reps in the “3+” week which is probably more than it was designed to do. 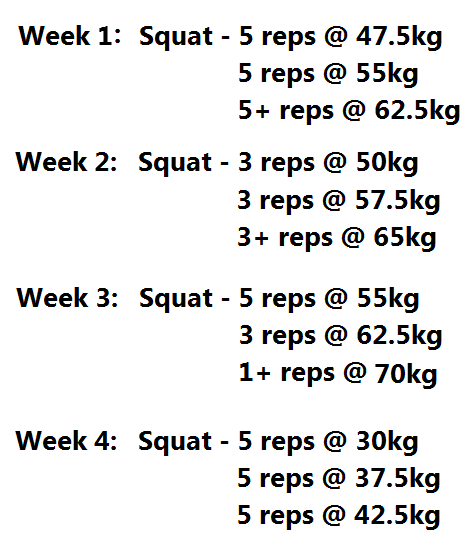 When I trained housemates at Uni I would use 5/3/1 and saw the high reps as an opportunity for them to practice technique, so it isn’t necessarily a negative point. For an intermediate or advanced lifter it requires the addition of Joker Sets (see Beyond 5/3/1) and some customisation to fully realise the benefits, but personally I think it’s better suited to a beginner with <18 months lifting experience. Some caveats are that the exercises are performed properly and you resist the urge to “skip ahead”, think of any high rep sets as practice for your technique rather than an indication you can lift more. The Westside template is very customisable and involves three main workouts in a week, one lower body and two upper body. The upper body is split into a low rep and a high rep day. There are 4-6 movements to be trained on each day, and each one has 3-5 exercises from which to choose. Your choice is usually determined by the equipment you have available to you, and personal preference. Simple layout. 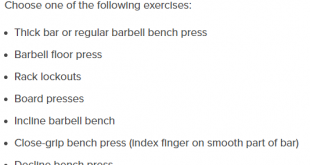 Movements listed A to F, with sets and reps explained for each as well as multiple exercises from which to select one. Ideal for athletes. This program was designed for competitive athletes who attend training multiple times a week outside of the gym. Note in an earlier image there was a training log titled “WS4SB Rugby Log”, that person might attend rugby training on a Wednesday evening and play a match on Saturday mornings. Other programs are too intense alongside sport, meaning you would be fatigued on Saturday morning and compromise your ability to perform on the field or worse, injure yourself. Balanced program. With athletes in mind, there’s a lot of focus on functional movements that transfer to sport and minimise injury risk while allowing you to express yourself athletically. Not ideal for a pure strength athlete. As it’s for athletes, the program is only 3 days/week and leaves room for additional workouts. The workload is too low for optimal strength gains. Lack of explosive lifts. Power is an important element in sport and this program doesn’t address that, though the newer WS4SB 3 solves this with a 4th day “Dynamic Lower Body” involving explosive jumps. 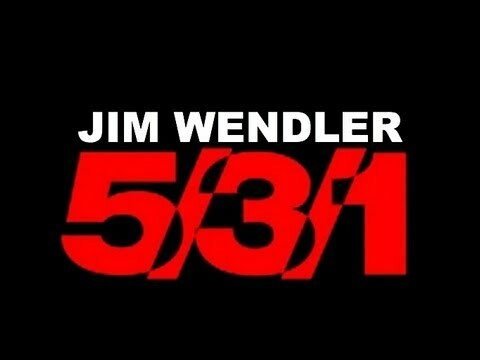 This is one of the best programs for athletes because it’s specifically designed with them in mind. If you are a recreational athlete and play soccer, rugby, tennis, hockey etc. a few times a week then this is the program for you. It’s not the best program for pure strength gains, but it complements your sports performance while building moderate amounts of muscle mass. Be sure to position the workouts at places in the week that minimise fatigue for your sport – don’t go and do the heavy Lower Body workout on Friday night if you have a game on Saturday afternoon! This program has gained popularity across Reddit and involves training 5-6 times per week. There are four upper body sessions and 1-2 lower body sessions, with the upper body split up into ‘push’ exercises and ‘pull’ exercises, with the lower body representing ‘legs’. They are positioned in the order they are written, so on a given week you might do Push on Monday, Pull on Tuesday, Legs on Wednesday, and repeat that order from Thursday through to Saturday. Some prefer a single session of legs in a given week, and so Saturday would be a rest day, while others switch it around and order it Pull Push Legs. Additionally, since there are two of each workout per week, it’s popular to consider one a ‘strength’ day and one a ‘repetition’ day, similar to the WS4SB low rep and high rep days. You might work in the 4-6 rep range on Monday’s Push day, and switch to 10-12 reps on Thursday. You would also have the freedom to select different exercises on those two days. High frequency. If you have the time then getting in the gym consistently and frequently is a sure way to make progress. Flexibility. If you know what you’re doing, then being able to select your favourite exercises on each day as well as sets and reps is a plus for some. With so much freedom there’s a danger that you’ll not be training optimally. Some of the templates have so much high rep work that strength gains might be slower to happen. Time consuming. If you have a full-time job and other commitments, getting in the gym six days per week is tough. Unlike other programs, you have no guidance on which exercises to choose. For an absolute beginner there’s probably not enough structure and they could end up lost. If you have the time then following PPL could be a nice way to train. It’s possible to find some trusted templates out there but otherwise it requires a foundational knowledge of exercise selection and optimal sets/reps which a true beginner may struggle with. There’s also so many exercises that you can lose sight of improving in the primary lifts (Deadlift, Squat, Bench Press etc.). The LP stands for Linear Progression, meaning the program is designed to help you lift progressively heavier weight every few weeks. It ties in the customisation aspect of WS4SB with the underlying focus on the primary lifts seen in 5/3/1 and is a very solid program. The core of the program is based around the Bench Press, Overhead Press, Squat and Deadlift, with additional exercises as you see fit. Options include ab work, biceps, triceps, calves, rowing movements and the Olympic lifts. On top of that there is the potential to include high frequency training for push ups and pull ups (see this article for how effective that can be) as well as short conditioning circuits and low intensity walking. First and foremost it’s tailored to improving your performance in the primary lifts, such as Deadlifts and Squats. Depending on your goal, the ‘plug-ins’ can be used to improve fat loss, conditioning or build more muscle. There’s built-in progressive overload as well as a method for dealing with plateaus. The ‘Base Program’ includes ‘5+’ sets, as seen in 5/3/1, with the opportunity to push yourself with AMRAP protecting against complacency. I’ve personally used the conditioning workouts to achieve a six pack in 10 weeks. The PDF takes a while to read, and anyone wanting a “quick and dirty” program will find the lengthy rules regarding things like failed reps a bit convoluted. Every session starts with a ‘pressing’ movement. It’s certainly a bias towards upper body but he explains the reasoning in the text. Those who prefer to separate workouts into upper body and lower body will not like this aspect. Quite technical. For a beginner the terminology and layout might be too complicated, and a simpler program would get the same or better results. This looks like one of the best programs around for an experienced lifter, and the customisable ‘plug-ins’ offer the chance to tailor the program to your own needs. Maybe not one for the newbies given the lengthy descriptions and simpler alternatives out there. 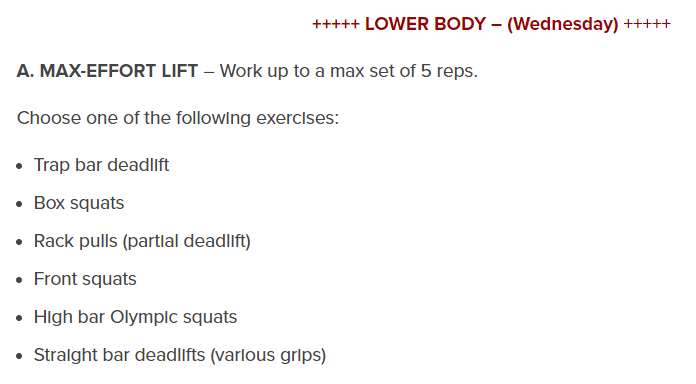 This program was written by strength coach Mark Rippetoe and centres around the primary lifts. It works on a two week cycle with three lifts performed three times per week. The three lifts can be recognised as Legs, Push and Pull. One of the best things about this program is that in his PDF he goes into incredible detail about the specific technique required for each exercise. Even if there’s nothing special about the programming, a beginner would benefit from reading through to learn the fundamentals of squatting, pressing and hip hinges. Main focus on progressive overload and primary lifts. Getting stronger in squats, bench and deadlifts should be the priority for new lifters. Great depth of explanation for each lift, discussing hand and foot placement, bar position and movement patterns required to perform each lift correctly. Squatting three times a week. For a beginner it will help to practice a lift so frequently and progress will be better than a single leg workout each week. 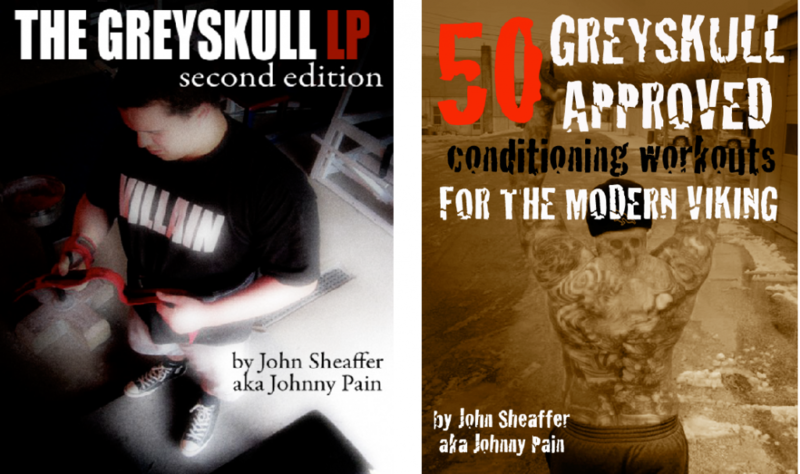 As the author explains, once you’re an experienced lifter you need added complexity in order for optimal progression, which is beyond the scope of this program. When you’re reached a sufficient strength level, squatting three times a week will put a limit on the intensity with which you can perform in any one session. This is a simple and effective program, with focus on the main lifts and an easy to understand structure to each session. The explanation of technique is one reason to get hold of a copy of Starting Strength (see Resources) and I wish I had discovered it sooner in my lifting career. If you’re a beginner, hone your technique and don’t fret over how much weight you are lifting, getting the basics down is far more important in the long run. Thanks for reading, in the next article I plan to tackle the issue of Exercise Selection.